Sometimes only a butterfly will do. 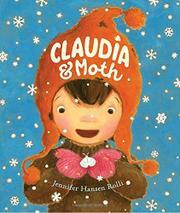 Claudia single-mindedly loves butterflies. She reclines in her room—a thin, smiling white girl in a summery dress—looking up at mobiles of paper butterflies that she cut out herself. Her mother won’t let her bring home a live butterfly from the park, but her father gives her a paint box, and she paints huge, poster-size butterfly portraits. When winter arrives, she despairs: “there was truly nothing left to paint.” Making butterflies in the snow in the park with her pet dog doesn’t compensate. The emergence of a moth from her sweater drawer perks her up, but he’s not quite a butterfly, so she paints him—literally paints his wings to resemble a butterfly’s. When he escapes out the window seeking a streetlight, she’s crushed. She “burst[s] out of the apartment” and recaptures him in the nighttime snow (not exactly plausible, but then neither was painting his wings), finally willing to paint him as the proper moth he is—a portrait, this time. From spot illustrations to full-bleed spreads, Rolli paints in oil on brown paper. At the park in summertime, the brown background feels seasonally off; it’s fine for autumn, but overall, this brown paper feels too earthbound—almost claustrophobic—for an homage to creatures that flutter through the air.